Marc Garneau was the first Canadian in space, but now as the federal Minister of Transport, he’s blasting off again – this time against distracted driving in this country. Just recently, Garneau came out in support of creating a consistent set of rules and penalties for distracted driving from coast to coast, especially when it comes to using electronic devices while driving. 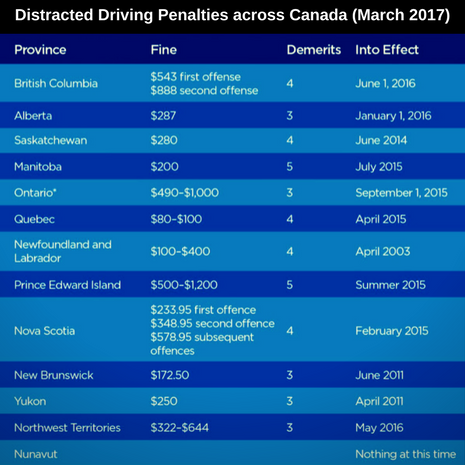 As it stands, distracted driving laws are a provincial and territorial matter and each has different rules and different ways of enforcing their laws. Here in BC, we have some of the toughest – a $543 fine for a first time offender. Up in Nunavut, there’s currently no law. All other provinces and territories have some form of fine and demerit system in place. If you look at car crashes across Canada in 2014, 20% of fatalities involved some form of distracted driving, and nearly a third of the people injured in a crash were the victim of a distracted driver. You don’t even have to look at the statistics to know this is a problem – stand at any street corner and watch the traffic go by and you’ll see more than a few heads turned away from the road. The potential for a horrific crash is there with every text, tweet, and swipe. If you are caught texting and driving you could even be charged with a criminal offence under the Criminal Code of Canada. A conviction for dangerous driving could result in a large fine, jail time, and a criminal record. The maximum jail time is five years for dangerous driving, 10 years for dangerous driving causing bodily harm, and 14 years for dangerous driving causing death. With distracted drivers injuring and killing thousands each year, Garneau has decided it is time to come back down to earth and take a hard look at introducing more severe civil consequences for distracted driving.